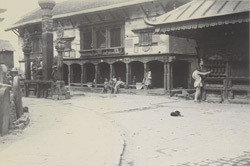 Photograph of a scene at the Buddhist shrine of Swayambhunath in Nepal, from an album of 30 prints credited to Herzog and Higgins, part of the Curzon Collection. Both Buddhism and Hinduism have flourished side by side in Nepal for centuries. Nepalese Buddhism is mostly of the Hinayana and Vajrayana form; the shrine of Swayambhunath is Nepal's most revered Buddhist temple and one of the most sacred Buddhist sites in the world. Tradition believes the stupa to be much older than its 5th century AD founding. It was renovated in the 14th century after a devastating raid by Muslim invaders from Bengal. It has since been restored several times, most recently in the early 20th century. In form, it consists of a gilded cube surmounting a huge white-washed dome and topped by a spire. It is surrounded by numerous shrines and votive objects.